In WEB based applications RESTful APIs are used to manipulate data between the browser and the server. User may enter some data which is formatted to a valid JSON object (Java Script Object Notation) before sending it to the server for processing. However at the server side this data may be stored in an XML format, which means we need to now convert this data from JSON to XML and vice-versa while sending data from server to the browser. Ensure that this file exists at the same location as the .class files of the above generated java files. 4. Write a simple class to perform the conversion. Note: Ensure to update the workspace variable in the above java class before executing in your local environment. If you see the below error, it means the jaxb.properties file (step2 above) is missing at the expected location or has incorrect property value pair. Thanks for the Great tutorial.. I need to add attribute in xml .. Can you guide me on this..
May I know what is the problem ? Hi Bhaskar. I have to convert an XML to a JSON but each one has it's own structure. Do you know if such a parser/converter exists? Underscore-java library has methods U.xmlToJson(xml) and U.jsonToXml(json). Hi Bhaskar, I have input JSON file need to convert in XML using JAVA class but order must be same. Is there a support for xml attributes in this when converting from JSON to XML. 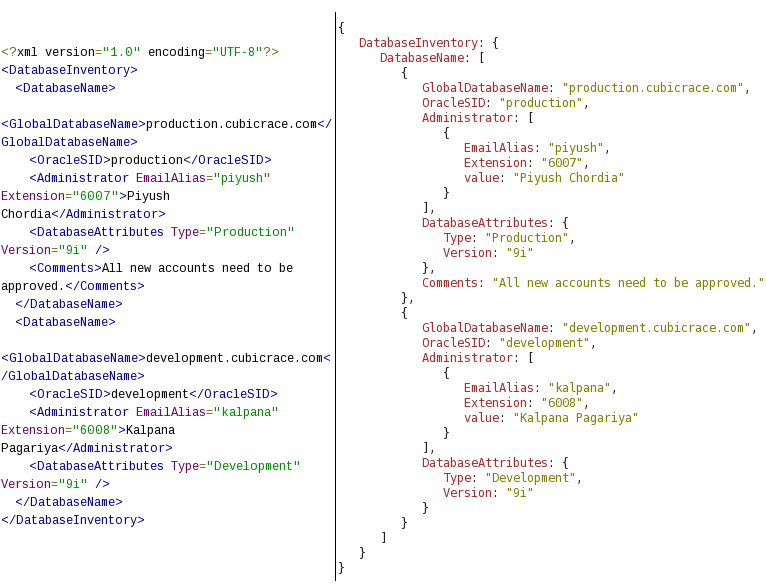 So for example, will it take JSON with keys prefixed with something like @ or att_, which tell the converter that it is an attribute and needs to to ingested in it's parent xml element? I want to convert json to xaml (for Silverlight Screen), Is this API feasible/ useful ?